The Benefits of Finding a PEO with our Help! Workforce Management Agency will help you find a Professional Employer Organization (PEO)! PEO is an acronym for Professional Employer Organization. A (PEO) or Professional Employer Organization is a business entity that helps service other businesses in the areas of Payroll Administration, Employee Benefits, Human Resources, and Risk Management. 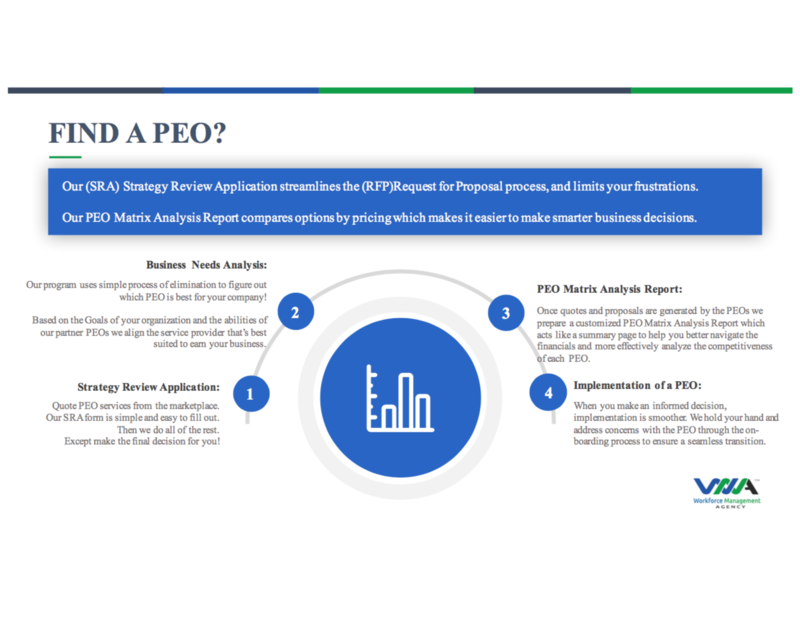 Workforce Management Agency helps businesses to learn the answers about some common questions like “how does a PEO work?” To find the advantages of using a PEO. Today, there’s approximately 980 PEOs that operate in the United States. Often, there’s a huge difference in understanding needs between the PEO and the prospective client from the onset. The need for a PEO to understand client needs and business purpose is vast and usually a PEO sales rep cares more about one thing signing you up. This often reflects in misunderstandings, and shows greatly in the service that a business receives. There’s a million variables. Any group with multiple locations in multiple states will enjoy using a PEO for its many benefits like streamlining processes and procedures. The overall employer-employee relationship experienced from an employees’ perspective shouldn’t vary by state or work location because HR is run separately and divided. That opens up tremendous exposure to risk, let alone will make a company look disorganized to talent upon recruitment. A PEO will streamline these processes and procedures so the company is run in a manner which is more uniform. This further protects the PEO’s client-entity from law suits over administrative mistakes that leave a business susceptible to discrimination or unfair treatment of employees. Most groups with more than 10 employees will likely find significant cost savings from the overall switch to a PEO. Typically, the larger the group, the greater the impact; a larger group is going to have higher participation in medical plans and benefits that are a tremendous cost burden to businesses and if the PEO can offer discounts against that larger volume of participation its a win-win; The PEO gains a new client and the client saves big time! If the group has common ownership entities, a PEO will help to keep the businesses protected by offering coverages to keep the employer group compliant while handling all of the added burden of paperwork and administration on reporting like the ACA 1095’s, 6055’s etc. which many HR staff are pressured to learn and understand how to accurately complete.